In December 2016, the Emirate of Ras Al Khaimah and the DIFC’s Dispute Resolution Authority (‘DRA’) entered into a set of agreements and memoranda of understanding aimed at developing further co-operation between the two jurisdictions, as Ammar Haykal explained in our February 2017 edition of Law Update. As Ammar noted, one of the key components of the new relationship was an Agreement on Judicial Co-operation with the DIFC Courts, which had been entered into by the Executive Council of the Government of Ras Al Khaimah, the Judicial Council of Ras Al Khaimah and the Ras Al Khaimah Courts on 12 December 2016. In that agreement, the Executive Council confirmed that the government agencies of Ras Al Khaimah, as well as any local or foreign investors operating in the Emirate, were now able to enter into contracts expressed to be subject to the exclusive or non-exclusive jurisdiction of the DIFC Courts. a letter has been received by the Ras Al Khaimah Courts from the DIFC Courts’ Registry asking for the judgment to be enforced. The effect of these provisions was to remove the need for claimants to take a DIFC Courts’ judgment to the Dubai Courts for conversion into a Dubai Courts’ judgment and subsequent referral on to the Ras Al Khaimah Courts under the so-called ‘deputisation’ process. The DRA approached Al Tamimi once the agreements were signed and had come into effect, asking us to participate in a reciprocal enforcement exercise to test the new mechanisms. A mock order of the DIFC Courts was filed by Al Tamimi for enforcement in the Courts of Ras Al Khaimah, in an exercise that is still ongoing. After decisions in the Court of First Instance and Court of Appeal, the Ras Al Khaimah Court of Cassation is currently considering the mock enforcement application. At the same time, we filed a reciprocal mock order with the Courts of Ras Al Khaimah for enforcement in the DIFC Courts. It is important to recognise that, although the facts of the exercise were made up and all judgments and orders made had no immediate effect, the legal machinery was tested as though the whole exercise were real. The fictitious facts are relatively simple. A ‘claim’ for just under AED1m was brought in Ras Al Khaimah stemming from an alleged breach of an international commodity murabaha contract that was to operate as a tawarruq. The lender, ‘Mohammad A. Bank LLC’ (the ‘Bank’) sued the borrower, ‘Ahmed B. Ltd’, (the ‘Borrower’) for both the costs due under the agreement and the profit margin after the Borrower ceased making his due payments. The Court in Ras Al Khaimah ‘awarded’ the Bank around AED 1.7m in damages, representing the Borrower’s outstanding obligations. The Borrower did not file any appeal within the prescribed time period, nor did he make any payment to the Bank in satisfaction of the judgment. On the basis that the Borrower held property in the DIFC, the Bank filed an application in the DIFC Courts for the recognition and enforcement of the judgment pursuant to the DIFC Court Law (no.10 of 2004), the Judicial Authority Law, the Agreement on Judicial Co-operation, and an earlier memorandum of understanding entered into in 2010 between the Courts of Ras Al Khaimah and the DIFC Courts. H.E. Justice Omar Al Muhairi considered the Bank’s application and made a (mock) enforcement order granting the application. In doing so, he recognised the judgment as binding within the DIFC and permitted that it be enforced in the same manner as a judgment or order of the DIFC Courts in accordance with the DIFC’s Court Law. Judgment was entered against the Borrower for the award amount plus costs and interest. The Borrower then applied to set aside the DIFC enforcement order. Numerous points were taken by the Borrower including arguments that may not have been made had the exercise been real. These arguments were made in the absence of the risk of a real adverse costs order against the Borrower and to better achieve the aim of the exercise, which was to test whether the DIFC-RAK agreements had proper legal effect and could deliver what they intended. In November 2018, Judicial Officer Nassir Al Nasser handed down his order with reasons rejecting the Borrower’s set-aside application. His consideration of some of the parties’ arguments is worth noting. 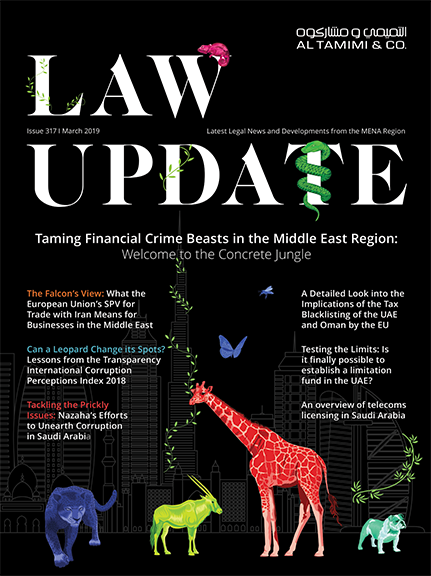 Issue 1: did the DIFC Courts have an inherent jurisdiction to enforce the RAK judgment, was the enforcement lawful under the DIFC’s own laws, and even if the RAK judgment were recognised, should enforcement be refused? He then went on to consider the doctrine of ‘derived judgments’, whereby a foreign judgment recognised and enforced by the DIFC Courts became a DIFC Courts’ judgment that fell within the scope of Article 7(6) of the Judicial Authority Law. Article 7(6) says that judgments, decisions, orders and ratified arbitral awards rendered outside the DIFC by any Court other than the Dubai Courts shall be executed within the DIFC in accordance with the process prescribed in the Rules of the DIFC Courts. The doctrine was explained by then Chief Justice Michael Hwang C in the DIFC Court of Appeal in DNB Bank ASA v (1) Gulf Eyadah Corporation (2) Gulf Navigation Holdings PJSC  DIFC CA 007 (‘DNB Judgment’), building on the Court’s earlier jurisprudence in Bocimar International NV v Emirates Trading Agency LLC  DIFC CFI 008 (Justice Sir John Chadwick) and Barclays Bank PLC & others v Essar Global Fund Limited  DIFC CFI 006 (Justice Sir Richard Field). The DNB Judgment also provided sufficient authority for the proposition that the Judicial Authority Law and the DIFC Court Law were the necessary enactments required by the Rules of the DIFC Court. The non-binding nature of the Agreement on Judicial Co-operation was irrelevant. As a result, the enforcement order was not outside the powers of the DIFC Courts under its own rules. The Borrower argued that the various RAK agreements could not be applied retrospectively to agreements between the Bank and the Borrower as there could not have been any contemplation at the relevant time by the Borrower that a dispute between the parties could lead to enforcement against his property in the DIFC or through the DIFC Courts. The 2010 memorandum of understanding was not legally binding and did not provide for enforcement in the DIFC. The Judicial Officer rejected these arguments on the grounds that the wording of Article 24(1)(b) was sufficient authority for enforcement, aside from the DIFC-RAK agreements. Issue 2: was the RAK judgment final and conclusive? The Borrower argued that the MOU with Ras Al Khaimah required the judgment for enforcement to be final and conclusive and that the mere fact that the Borrower had not appealed in time was not enough (although he did not argue that an averred dismissal or refusal of any appeal was required). The RAK judgment was theoretically open to judicial review and could not be characterised as final and conclusive. The Bank rejected this arguing the common law principles on recognition and enforcement applied whether or not they were stipulated by the agreements with Ras Al Khaimah. On the facts, the Borrower failed to appeal the RAK judgment within the prescribed period or at all. The Judicial Officer was not willing to go as far as the Bank invited him to go and imply the common law rules on recognition and enforcement into the RAK agreements, noting instead that the documents were ‘aided and gaps filled by common law principles’. The Judicial Officer instead noted that reciprocity of enforcement under the agreements (RAK to DIFC and vice versa) required that the judgments of each court be ‘placed on an equal footing’. Issue 3: was enforcement of the RAK judgment contrary to the overriding objective of the rules of the DIFC Courts? The Borrower argued that enforcement was contrary to the Overriding Objective, which mandates, inter alia, that the Court is required to deal justly with the cases before it. Justice demanded that the enforcement order be set aside so the Courts in Ras Al Khaimah could re-hear the dispute and hear the enforcement application. The Borrower had been unrepresented before those Courts and he argued he had been deprived of the chance to present his case in full. The Bank opposed this on the grounds that it had a right to recognition and enforcement of its judgment, which was required by statute. To deny the force of this right would be procedurally unfair and giving effect to the Overriding Objective did not mean such a denial. In concurring with the Bank, the Judicial Officer noted that the RAK judgment was not, on its face, defective in any way, and the Overriding Objective could not be applied by the DIFC Courts to proceedings in other jurisdictions. Issue 4: was enforcement of the RAK judgment abusive of the DIFC Courts’ process because it was against assets located outside the DIFC? The Borrower’s final set of arguments turned on the fact that some of his assets against which the Bank sought enforcement were actually within the DIFC, i.e. ‘onshore’ Dubai. This raised the spectre, firstly, that the Bank would bring further proceedings in the Dubai Courts for enforcement, and second, this would trigger a referral to the Joint Judicial Committee established by Decree 19/2016 that decided on conflicts of jurisdiction between the Dubai and DIFC Courts. The Judicial Officer and the Bank relied on the clear wording of Articles 7(6) of the Judicial Authority Law and 42 of the DIFC Court Law (the latter specifically states that judgments ‘ratified by the DIFC Court may be enforced outside the DIFC in accordance with the Judicial Authority Law;). The Bank had the right to enforce in the DIFC and that could not be precluded by any other rights it had to enforce elsewhere. In any event, the Bank had the right to onward enforce the DIFC Courts’ enforcement order in the Dubai Courts, in a sequential plan of attack. The Borrower’s application to set aside therefore failed in its entirety. As Ammar has previously noted, the real impact of the DIFC-RAK agreements will only be seen once they are used and become embedded in the respective legal systems. The reasoning in the DRA-RAK moot exercise is very important because it tests, in an adversarial format, the recognition and enforcement processes. 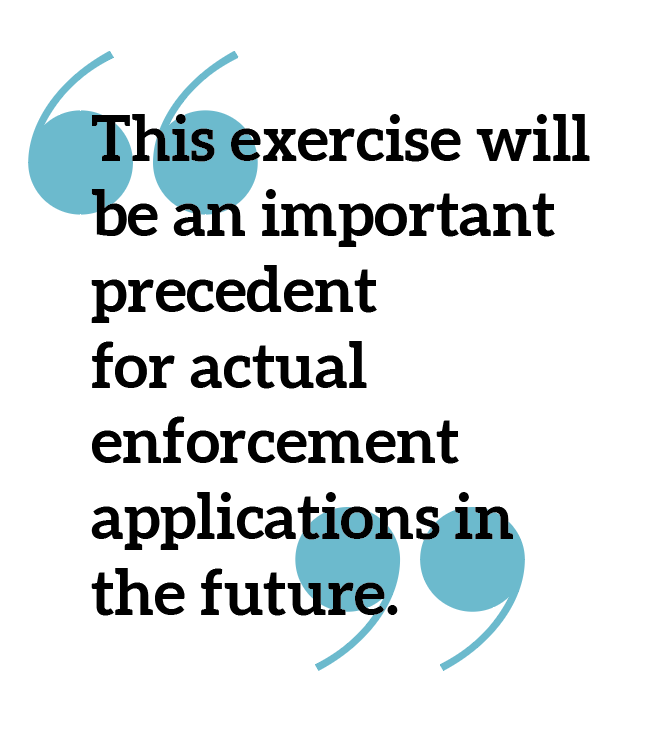 As such, notwithstanding the necessarily limited factual matrix, this exercise will be an important precedent for actual enforcement applications in the future. Al Tamimi & Company’s DIFC Litigation team regularly advises on the recognition and enforcement of judgments from other UAE Courts. For further information, please contact Rita Jaballah (r.jaballah@tamimi.com) or Peter Smith (p.smith@tamimi.com).